Corsair recently rebranded their gaming division, bringing along a new logo and a more straightforward name – Corsair Gaming. 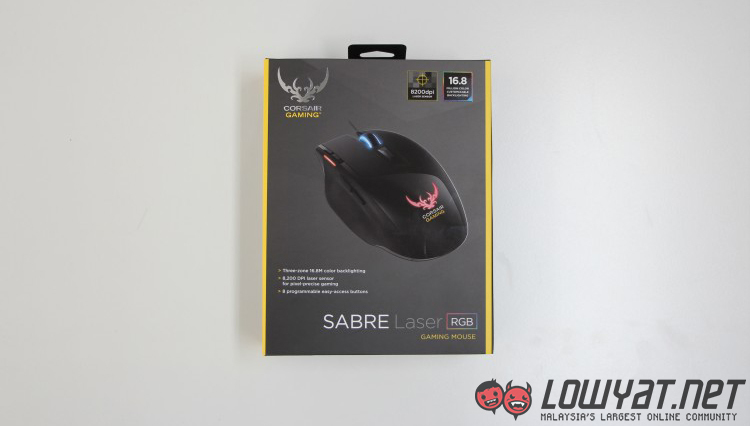 The Corsair Gaming Sabre Laser RGB Gaming Mouse is one of the new products spawned under the redesigned Corsair Gaming division. 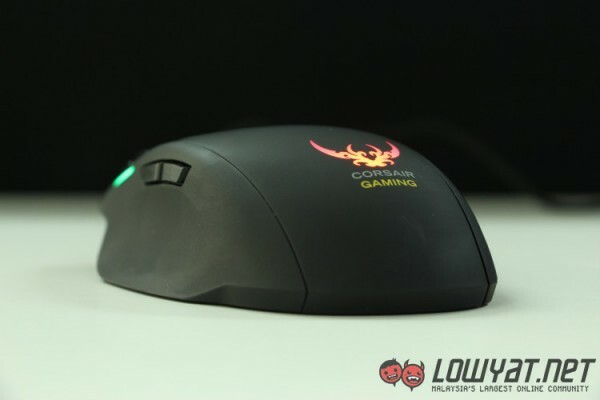 It is a gaming mouse with an 8,200 dpi laser sensor, Omron switches, 8-programmable buttons, sold for RM269 inclusive of GST. 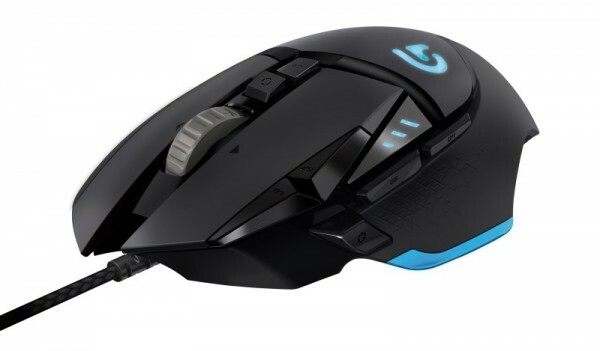 Is it a gaming mouse that is worth the bang for buck, or is it just another overpriced gaming product? Let’s start off with the box. The packaging is straightforward as can be and the design is similar to Logitech’s G series or Razer’s gaming mice, except for the colour scheme. 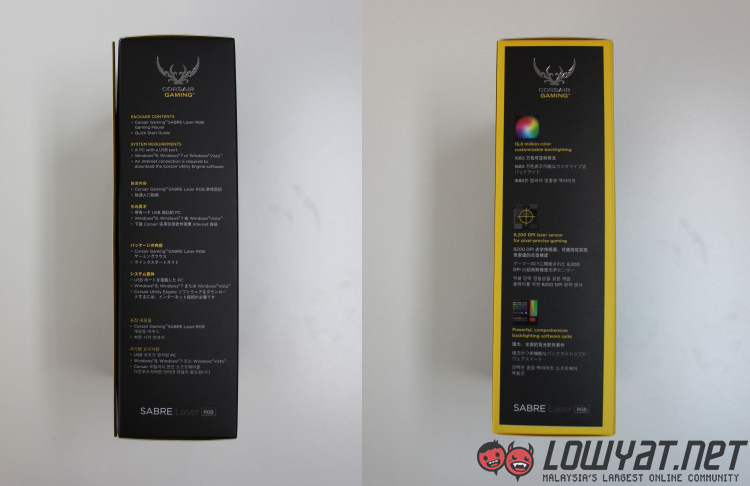 Corsair uses a black and yellow theme for the Sabre’s packaging with a flip lid to give the users a good look at the gaming mouse. 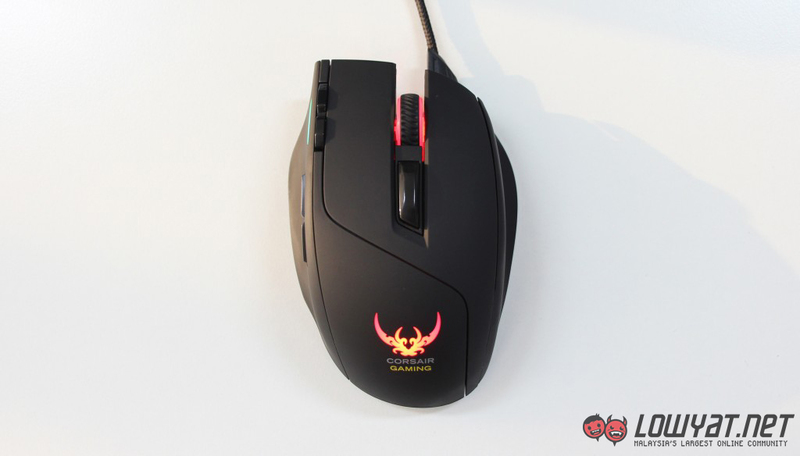 The Corsair Gaming Sabre Laser RGB mouse is more suited for players with a claw or finger grip. 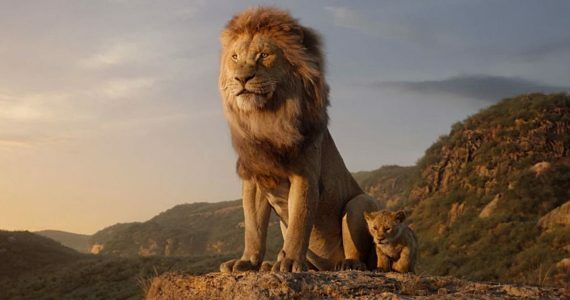 This is because of the mouse’s shorter body and taller height. Upon holding it for the first time, I liked how solid and comfortable it felt in the hands, thanks to its fully black soft-touch rubber surface. 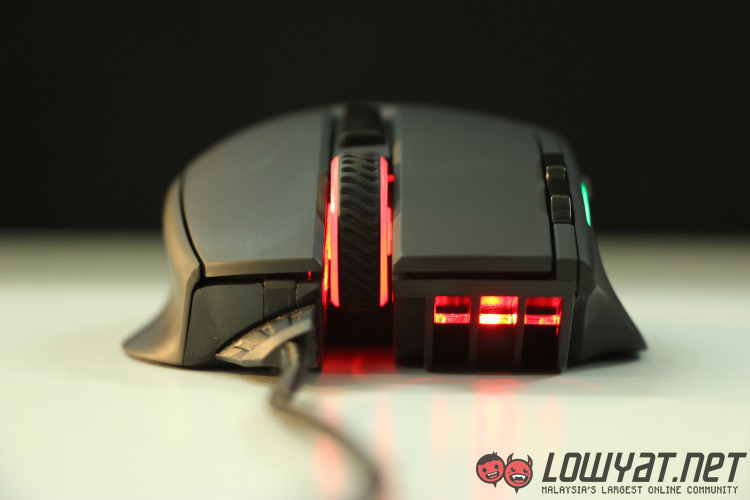 There are a few clear sections for the LED lights to shine through, giving the mouse some illumination during those late-night gaming sessions. The light section on the side indicates the DPI level the mouse is set at. 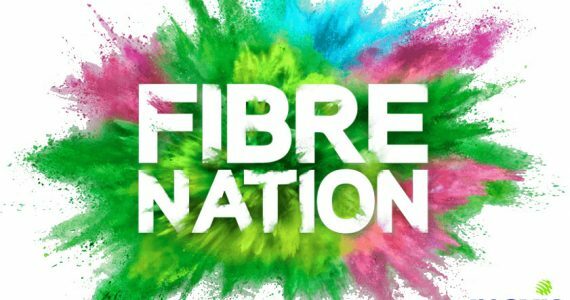 From the lowest to the highest – red, white, green, orange and blue. Looking at the mouse from the front, users will find that the cable is placed off-centre, and given a reinforced mould to prevent it from damaging or bending over time. Not only that, users will also find a small chevron grill, which is also another customisable lighting area. 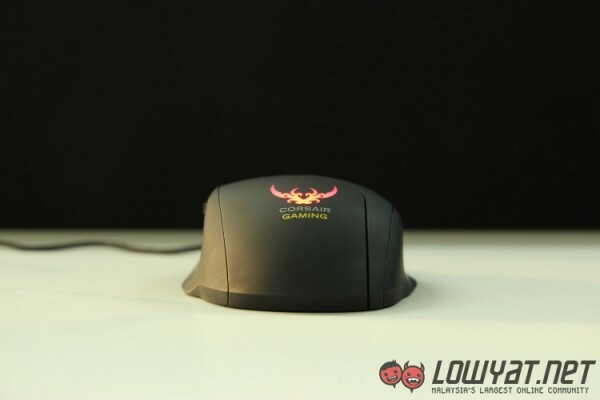 The back of the mouse only consists of the large branding logo of Corsair Gaming, which also features customisable lighting. 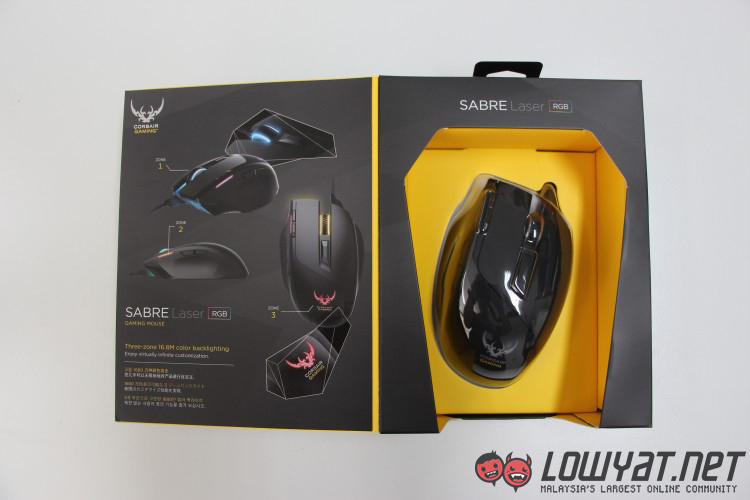 The Sabre has a matte surface for additional grip, which is necessary for gamers to keep the mouse in their hands. On the left side of the mouse, there is the dual-thumb button and a light section towards the front of the mouse. The dual-thumb buttons feels really solid in each click and I liked that it didn’t get in the way of most of my gaming sessions. Because of its higher button placement, I had to purposely move my thumb to actually click the keys. 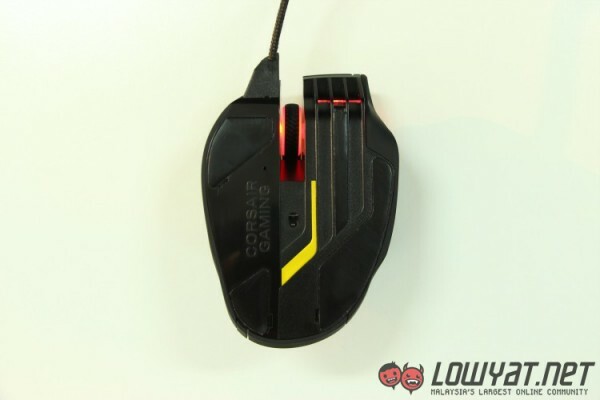 There are two ridges on each side of the mouse to let users rest their thumb and fingers, and this makes long gaming sessions more comfortable. 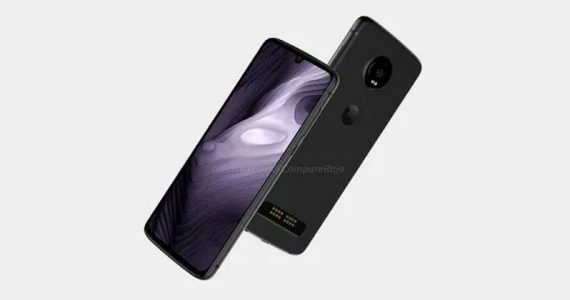 On the top, aside from the usual left/right click buttons, the clickable scroll wheel and the DPI toggling button behind it, users will also find two additional keys located at the top left corner of the mouse. For me, the two additional keys were spaced out a little too far, so it might be quite awkward to use those keys in-game. 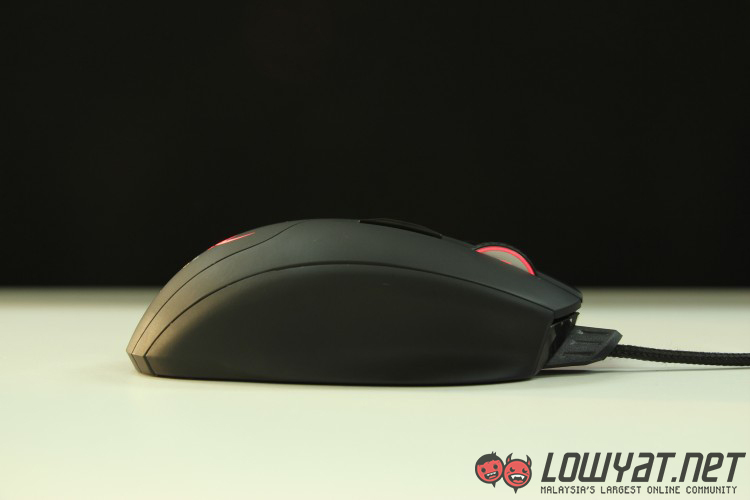 On the bottom, is where you can find the 8,200 dpi laser sensor and several large PTFE feet, which gives the mouse an extra-smooth glide. 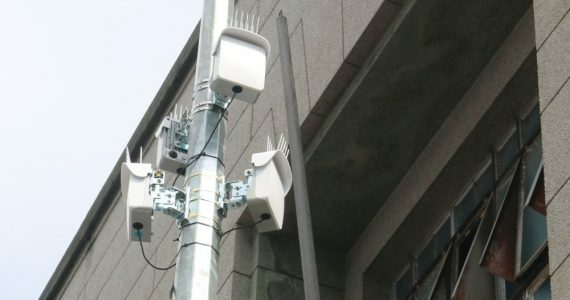 Besides that, the cable is braided to prolong the lifespan of the cable and prevent it from tearing. I like the overall weight of the mouse and how comfortable the grip is in the hands. 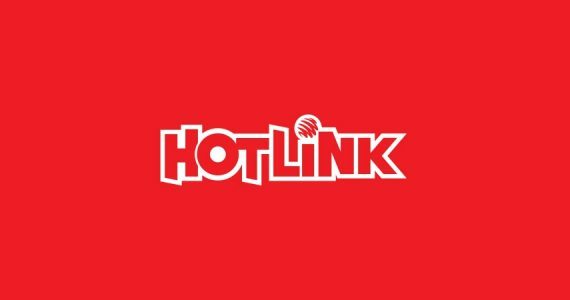 I tried it with several games like the popular first person shooter, CS:GO and multiplayer online battle arena, Dota 2. During my test session with CS:GO, I found that the mouse does indeed fit my claw grip hands, but it was rather hard for me to left click because of its front overhang. Although it didn’t happen with every click but it certainly does get annoying after a while. Not only that, I liked how solid the scroll wheel was when I used scroll down to jump in the game. Each scroll feels firm and accurate, assuring me the scroll was registered. 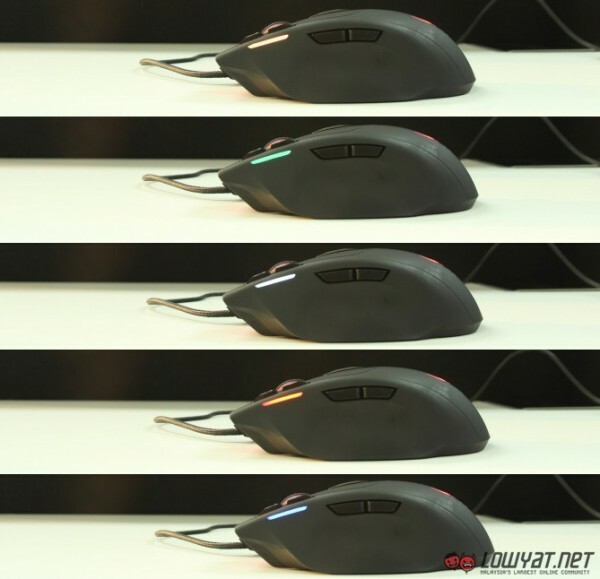 On Dota 2, the mouse performed well as it could handle the constant right-clicking without an issue. I configured the dual-thumb buttons on the side as the push-to-talk button and the “Well Played!” key, while the two additional keys on the top were set to macro buttons which gets the courier to send items, and to activate item slot 1. I liked that all the buttons were utilising Omron switches, which are rated for 20 million clicks. The clicks felt firm and not flimsy, and Omron switches would definitely extend the lifespan and durability of the mouse. 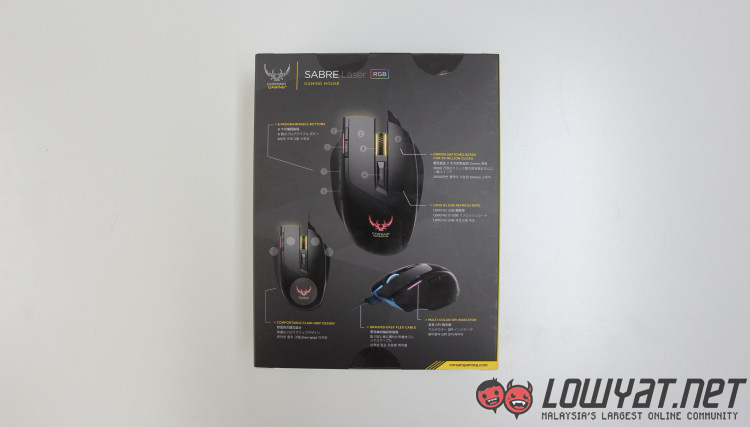 This makes the overall experience even better while gaming on the Corsair Sabre gaming mouse. In terms of dots-per-inch (DPI) performance, the default setting starts off at 400 dpi and the highest being 6,000 dpi. 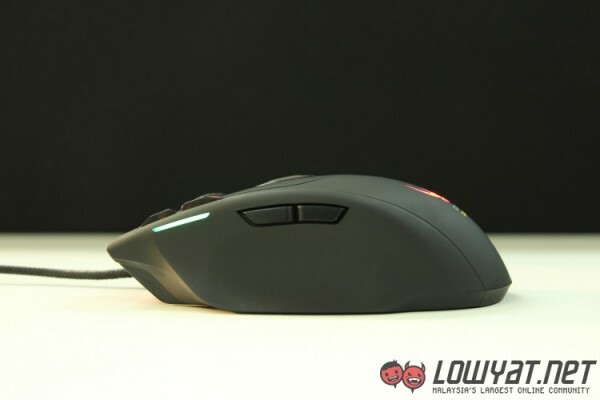 However, after going through the settings, the mouse can actually be set to the lowest dpi of 50 and the highest, which is 8,200 dpi. 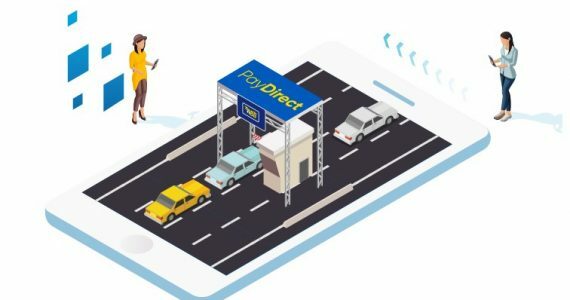 The dpi can be set to toggle between five stages for different scenarios. For me, I use 200 dpi when I’m doing detailed photoshopping, 2,000 dpi for normal browsing and 3,500 dpi when I’m gaming. 8,200 dpi felt a bit of an overkill for me but I’m guessing there are gamers out there who need that level of mouse sensitivity for their games. 2,000 dpi was more than enough for normal usage. On the other hand, when I connected my laptop to an external 23-inch monitor, I found that the 2,000 dpi felt a bit slow. I’m more of a mouse wrist player and the 2,000 dpi made me move my elbow more than my wrist. Upon connecting the mouse to my laptop, it worked right off the bat but only as a normal mouse. 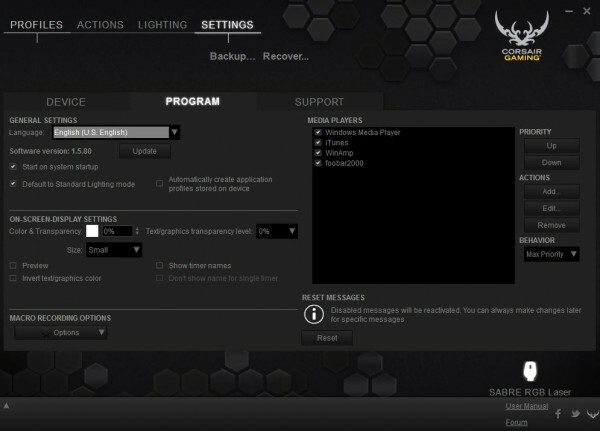 Further customisation would require the installation of the Corsair gaming software – the Corsair Utility Engine, which is what I did. 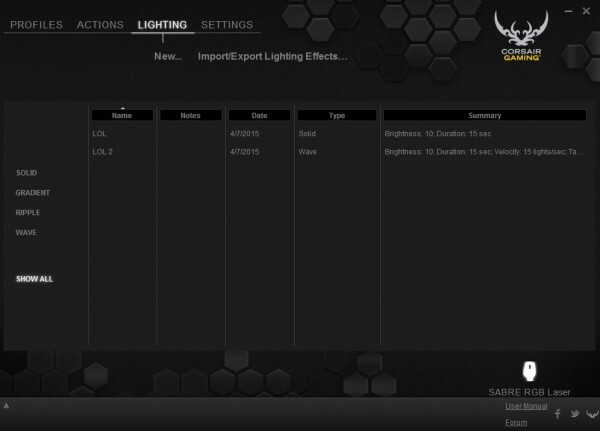 This is the gaming software that allows me to create or load key profiles for my games, customise the lighting features of the mouse, and also to create macro keys. If I have any other Corsair gaming peripherals (which I do not), it can also be controlled from the Corsair utility Engine. The landing page is pretty straightforward as this is where I can re-map the eight programmable keys found on the Sabre. There were many things I didn’t like about the software but let’s start off with what I liked. The Settings page was quite helpful in the sense that updates to the firmware of the mouse can easily be done with a single click. 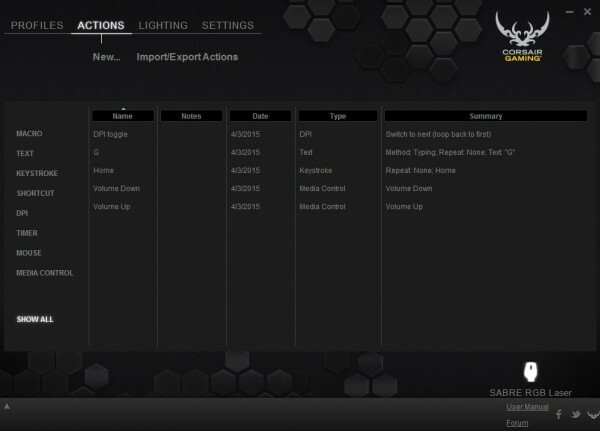 There were also settings for the on-screen display (OSD) options as well as contact support at the bottom right of the software. The lighting customisation page was also easy to navigate as I only needed to click the lighting area I want to change, and pick a colour from the 16.8 million colour spectrum. 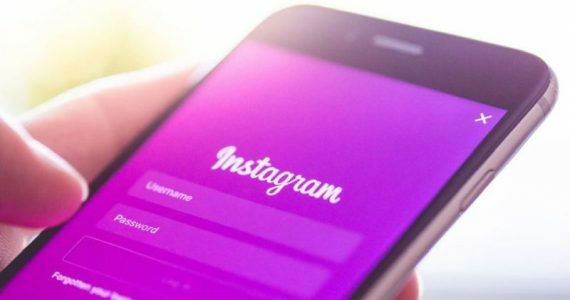 Now, what I didn’t like about the software is that it can be rather complicated to set up profiles as the navigation through the software can be a bit confusing. How the lights illuminate on the mouse can also be changed – from solid, to gradient, ripple and wave. That being said, I had a tough time figuring out how to apply the lighting onto the different sections of the mouse. 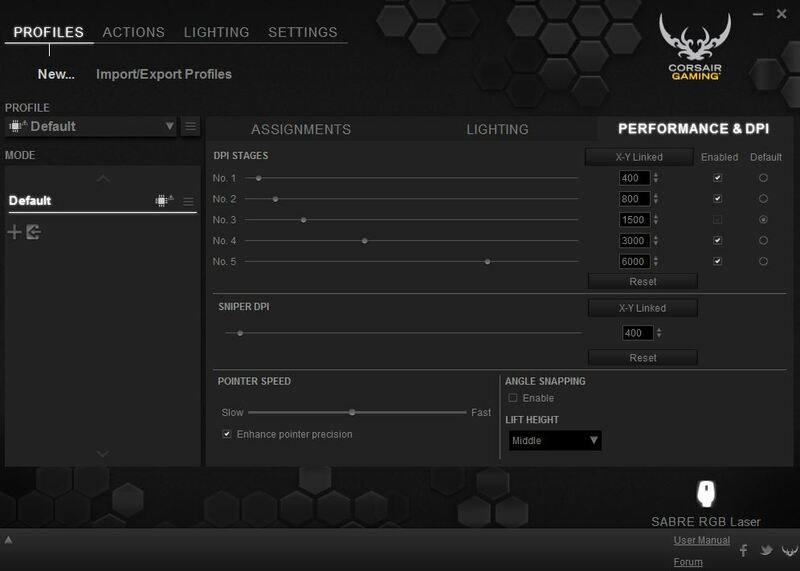 It is the software that is taking up most of my time, just learning how to set up the brand new Corsair Sabre Laser RGB Gaming Mouse. The mouse definitely has several great features, but for the price of RM269 (inclusive of GST), is it worth it? 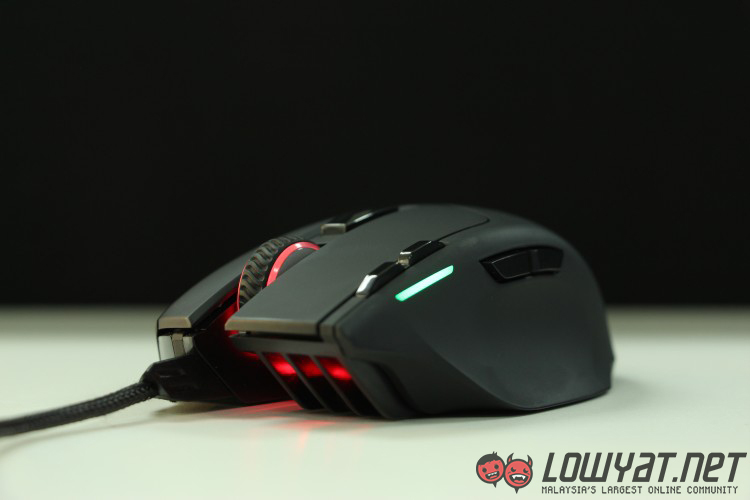 The mouse is slightly more expensive as there are other gaming mice out there in the market which has more to offer. First, the Razer Deathadder Chroma sells for RM239 and it is a gaming mouse which has five-programmable buttons, a 10,000 DPI sensor and also 16.8 million colours to choose from for lighting customisation. On the other hand, Logitech’s Proteus Core G502 gaming mouse is also priced at RM239. For that price, gamers will be getting a mouse that has 11 programmable buttons, a 12,000 DPI sensor with adjustable weight, but no lighting customisation option. Just like any other Corsair gaming mice, the Sabre comes with a standard two-year warranty. It feels good in the hands of a claw grip or finger grip gamer, and it has just the right amount of weight. Its build quality is superb and it definitely feels solid and firm in the hand. The mouse is still comfortable even when gaming over long periods of time. It might take a while to get the software to co-operate properly with the mouse, but once that’s out of the way, users will be ready to take on any opponent who stands in their way. 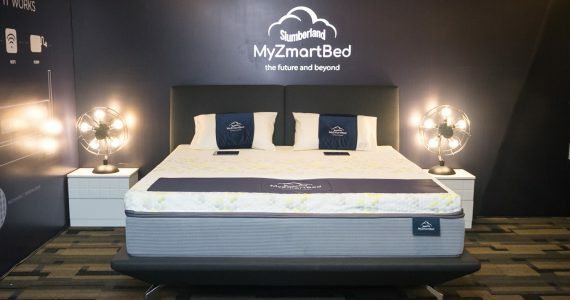 For the price of RM269, I personally feel it is a bit costly, but if the price was lower, it would definitely give competitors a run for their money.